The Leopard at des Artistes in Manhattan at the Hôtel des Artistes is an immaculate restaurant that spectacularly revives the concept of typical southern Italian cuisine, tradition and service. Guests are surrounded by the works of Howard Chandler Christy, originally a tenant in the building. 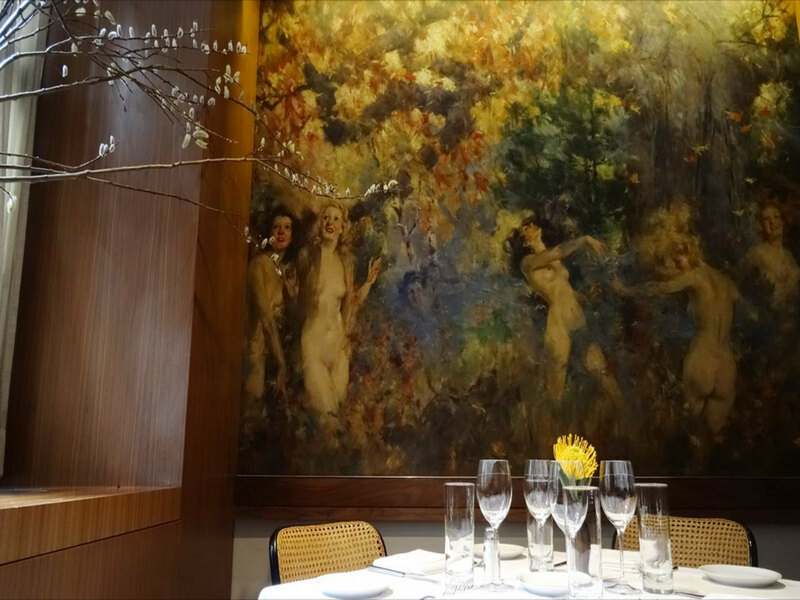 The intricately painted stories embracing the restaurant’s walls are based on wood nymphs. The full restaurant underwent a complete renovation in 2011, including immaculate revivals of each mural. The phenomenal service reminds guests that they are stepping into a home away from home. The delicious food creations, with completely fresh ingredients, is reminiscent of a traditional European hotspot. Their cruddo di branzino has a burst of flavours from fresh fennel, and a taste of orange; the grilled octopus is a delightful antipasti that with a simple mix of lemon and olive oil dressing balanced with pickled onions to add an extra tang. Although incredibly simple, their grano saraceno is a delicate mix of wild buckwheat fettuccine, fresh cherry tomatoes and basil. For a more pescatarian option, their bucatini alle sarde is the way to go, awakening the senses. Above, from top: Il gattopardo, or meatballs with cabbage. Veal braciola. Almond frangipane tart of seasonal fresh fruits on vanilla custard. Maltagliati with wild game and porcini mushroom ragú. Grilled lamb chops scottadito. Executive chef Vito Gnazzo. For main course options, guests can’t go wrong whether they want to go for a simple poached halibut with clams and mussels or a more filling rib-eye. There is always an option that would fulfil any guest’s desires. Their selection of desserts are guilty pleasures worth indulging in. The traditional zabaione with fresh berries is mouth-watering, as it is prepared directly at the table. The mélange of egg yolks, sweet wine and sugar beautifully covers the cup full of blueberries, blackberries, raspberries and strawberries. The Norwegian Jewel was docked at Wellington at the end of last year, and we had the privilege of joining some local media, and were very well looked after by Norwegian Cruise Lines’ Sydney-based marketing manager Michelle Wiederman, who is a credit to her company. First up, it’s not a Norwegian company at all—they’re HQed in Florida—and Wiederman was first to admit, after finding out that our previous experience of a ship-board famil was with a top-end luxury cruise line, that Norwegian Cruise Lines’ market was far broader, going from everyday travellers right up to those expecting more premium suites. The Norwegian Jewel certainly had plenty of amenities, from multiple dining areas covering different types of cuisine, including an outside dining area where casual, relaxed seating was the rule, to a large casino area and massive theatre for live shows. But its best feature, we felt, was the shipboard Mandara Spa, and guests should get in quickly and book if they want to be truly pampered during their travels. Massages, water therapies, body wraps, steam rooms—with a relaxing area at the bow. There’s something truly freeing about getting pampered knowing you’re away from it all mid-ocean, and it’s probably no coincidence that Norwegian placed the Mandara Spa just where it did on board the Jewel.